It is nice to see a statement that doesn’t involve race. These police officers were doing their job and protecting the citizens that were protesting against them. Former President George W. Bush and his wife, Laura, released a statement this morning on the attack that killed five Dallas police officers. Laura and I are heartbroken by the heinous acts of violence in our city last night. Murdering the innocent is always evil, never more so than when the lives taken belong to those who protect our families and communities. Laura and I have seen firsthand the dedication, professionalism, and courage of the Dallas Police Department. 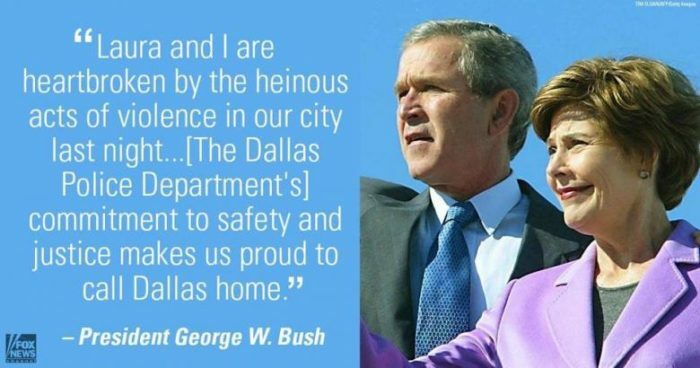 Their commitment to safety and justice makes us proud to call Dallas home. Our hearts go out to the families of the fallen. We pray for the wounded officers to recover fully and quickly. We commend Mayor Rawlings, Chief Brown, and all our city’s leaders and public servants who continue to organize an effective response to this tragedy. And we join our fellow citizens in saluting the fine law enforcement officers in Dallas and across the country who put their own lives on the line to keep all lives safe.